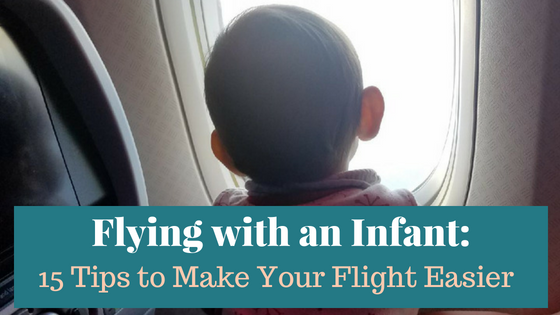 Preparing to take a flight with an infant is no easy task. We have taken Chulengo on over a dozen round-trip flights in his first ten months of life. Because we moved when Chulengo was only seven months old, we took many trips to our new town to find a home and prepare for the move. We also have family and friends spread all over the country, who we love to visit regularly. Therefore, we have become very comfortable flying with an infant. We took Chulengo on his first flight when he was six weeks old. Looking back, we were so anxious but flying when Chulengo was so small was a piece of cake. He slept the entire flight and nursed easily on taking off and landing. Traveling with Chulengo as a 10-month-old is much different. We have to entertain him quite a bit and befriend the folks next to us to make the flight more enjoyable. Each flight is different from the next. Variables that can make a plane ride more or less comfortable include: How full is the plane? How long is the trip? What time of day is the flight? Am I traveling alone with Chulengo? How tired is Chulengo? Thankfully, most flights with Chulengo have been uneventful, but I will never forget the plane ride when he cried hysterically for over an hour on a three-hour trip. He wouldn’t nurse, or sleep, or sit in his car seat. He didn’t want to lie in our arms. And he didn’t have a wet or dirty diaper. There was nothing we could do to soothe Chulengo. Eventually, my husband could sense my frustration and took Chulengo for a walk to the back of the plane. I heard him crying from our seats near the front of the airplane, and I cried too, wanting to melt into the floor. My mind was racing. What was I doing wrong? Why wouldn’t he calm down for me? I knew what the people around me were thinking. I used to be one of those people (without kids) who was annoyed when someone couldn’t keep their baby from crying. Now I am the one who can’t calm my son down. In those few minutes alone I focused on my breathing, trying to come up with a soothing technique we hadn’t tried yet. All of the sudden it clicked —- the swaddle. Chulengo loved the swaddle at home, but I didn’t think to use it on the plane. My husband came back to our seats with Chulengo who was still upset. I grabbed Chulengo’s blanket, wrapped him up tight and rocked him. Instantly, he stopped crying. The sense of relief that came over me was incredible. My point here is no matter how prepared you are if you take enough flights you are bound to have a crummy trip where your baby is unhappy. No matter what you try, your baby is miserable. Don’t beat yourself up. Don’t worry about the people around you. Most of the time, those who have had children know what you are going through and will be patient with you. Those who don’t have children will not understand. I always try to remember that Chulengo feeds off my energy. So I try to take a step back, breathe and know that this difficult time will not last forever. We have learned not to take Chulengo on a late night flight because that is when he is most fussy. We plan for early morning or early afternoon flights when he is most happy. When carrying a baby through security, keeping your shoes on and liquids/electronics in a bag are crucial. Lines through pre-check security are typically shorter, getting you to your gate sooner. Each airline has their policies and procedures, so it is essential to know what your chosen airline expects. What documents do you need to register your infant to for the flight? If your little one will be on your lap for the flight, can you add their information to your reservation over the phone? Or do you need to do it in person the day of the trip? Are you able to check a car seat and stroller at the gate? Chulengo poops before every flight. Every. Single. Flight. We joke that he must have flight anxiety. Extra diapers are a must for us. We also put Chulengo in a night-time diaper for the trip to buy us some time if we can’t change his diaper right away. A friend once had to wrap her baby up in her jacket because she blew out of her clothes on the plane and didn’t have a change of clothes. Extra outfits are crucial to keeping baby comfortable. Going to the bathroom is not easy when you are traveling alone and wearing your baby. It’s hard enough to find a place to put my backpack, let alone my child. So, I keep Chulengo on me. I can’t bring myself to set Chulengo on the ground. Yuck! I find leggings are the most accessible pants to wear since there are no zippers or buttons and I can pull them up with one hand while wearing Chulengo. Nothing is worse than carrying your baby with a lopsided diaper bag and trying to get your ID out of your wallet to get through security. 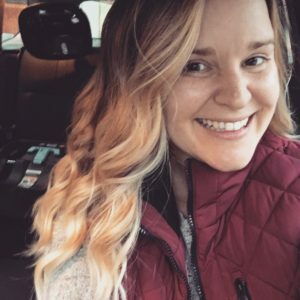 I use a backpack style diaper bag and a baby carrier with pockets to keep my hands free and still carry necessities with me that I can easily access. We had to wait 2.5 hours to check our bags, the first time we flew with Chulengo. Thankfully we planned for any issues and got to the airport SUPER early. We prefer to be walking into the airport at least 2-3 hours before the flight. We arrive even earlier during the holidays. Allowing for plenty of time gives us a chance to get a bite to eat because eating on a plane with a baby is pretty tricky. We also go to the bathroom and get Chulengo prepared with a new diaper. We will walk around with Chulengo until the flight boards to tire him out. We usually fly with Chulengo on our laps because he is under two. If the flight is not sold out, we can carry our car seat on the plane and let Chulengo rest in his car seat. Some airlines will allow Chulengo to have an extra seat without a fee. I also like to prepare for a full flight mentally. If we are lucky, our plane will be quite empty. Those flights are more enjoyable because most folks will choose to sit next to pretty much anyone other than an infant. Therefore, we get an open seat next to us. If we get to choose our seats on the plane, we typically pick one aisle and one window seat. Leaving the middle seat open. Therefore if they do not sell the middle seat, we have the entire row to ourselves. If someone does buy the middle seat, then they are usually more than happy to give up their middle seat for us and take the aisle seat. When I travel with Chulengo by myself, my husband can get a pass from the airline check-in counter to walk me to gate. He helps with the pre-flight diaper change, and this allows me to use the bathroom alone. What mom doesn’t enjoy a bathroom trip alone, lol! Having the stroller will free up your hands to allow you to use the bathroom, organize bags, and grab a bite to eat. I only recommend this when you have an adult travel partner and not when you are traveling along with an infant. Having an extra set of hands makes packing up the stroller and car seat easy, which is difficult to do alone. Changing tables may be in all bathrooms or only one. If there is only one, it is good to know if it is in front of the plan or back of the plane. Mid-flight diaper changes are a lot easier when you know ahead of time which bathroom has a changing station. Bring sanitizing wipes with you on the plane—lots of them. You never know who sat in your seat last, who sneezed on the tray or who didn’t wash their hands after using the bathroom. Gross, I know. We wipe down the seat, the tray, the seatbelt, the wall, the window, the armrests, the back of the seat in front of us. Any surface we see or Chulengo can touch, we wipe down. Nursing, taking a bottle, or sucking on a pacifier is helpful on take off and landing to soothe baby. I try to wait to nurse Chulengo until the plane is literally about to take off and if Chulengo doesn’t want to nurse, I offer the pacifier. Same with the landing. I had made a mistake in the past of nursing as soon as we got on the plane, which was not helpful when we didn’t take off until 45 minutes later due to a delay. When the flight attendant is taking drink orders, I request a bottle of water instead of a cup of water. It is typically easier to drink while holding a child and less likely to spill than a cup. Once we get off the plane, we try to find a family bathroom or nursing room where we can use the bathroom and change Chulengo’s diaper/clothes before we get our checked luggage. A separate room allows us to take a break from the public to regroup and get ourselves comfortable. Overall, flying with a little one is never easy. You will have excellent flights, and you will have trips where you will want to jump out of the plane. Prepare as well as you can for each flight. But at the end of the day, know that you are a good mom —you got this! If you have other tips you would like to share, please comment below! 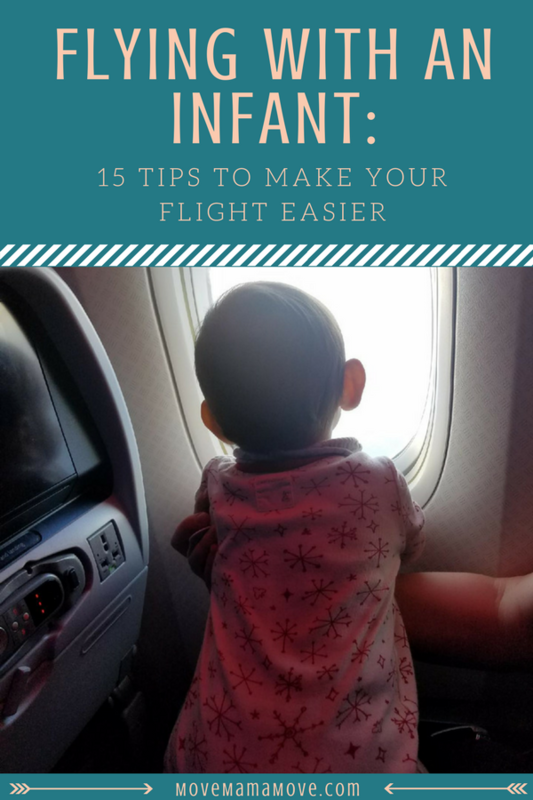 These are all great tips to follow when traveling with a little one. I knew TSA pre-check existed but wouldn’t have thought to enroll prior to traveling with our baby. It must make the trip to the airport even just a little more easy! Yes! TSA Pre-check = the best thing ever. Great tips! We fly back home very often so I’ll definitely keep these in mind! Great tips! I love traveling with my baby. Although it can be stressful and hard I think it is important to show them the world! Thank you! It is so great to travel with a little one – but only when you feel prepared and ready. So hopefully this artical can help folks out.